We are an association of amateur electronic organ builders who share the enjoyment of building and playing our own instruments. We have members in the UK and abroad, and have been in existence for over 50 years, sharing our knowledge and supporting each other. This enables us to build instruments of amazing sound quality, virtually indistinguishable from CD recordings. We can build such instruments for a small fraction of the cost of commercial ones. Whether you’re an experienced electronic organ builder or an interested beginner, we're sure you’ll find something to interest you. The Electronic Organ Constructors Society, EOCS for short, caters for builders of both Classical Organs and Theatre Organs. Members can obtain kits or ready built modules, using technologies from discrete transistor to digital circuits and PCs. The latest PC organs, using Hauptwerk for example, offer incredibly realistic organ sounds, using sound-sample sets recorded on great instruments from around Europe and beyond. For instance, at the touch of a button, you could play an English Willis, or a French Cavaillé-Coll or a German Silbermann, or an American Wurlitzer. including presentation by David Butcher of Lavender Audio; see Members page for details. 3 manual Keyboard Stack Design completed. 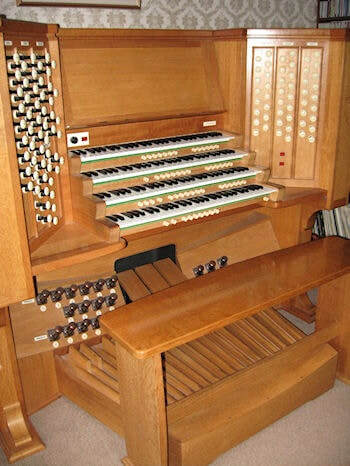 The organs shown above are fine examples, but most of us have built more modest instruments, see the PICTURE GALLERY. This does not mean compromising on sound quality, see the SOUND GALLERY for some recordings. Free benefits for EOCS members include 4 magazines per year, two meetings in London, a Resources Booklet, and access to the Members Webpages. The Resources Booklet contains a list of members with their areas of expertise and interest, and their contact arrangements. On the Members' Page you will find detailed information on built units, kits, technical references, for sale/free/wanted, and much more. Please feel free to look around our website and find out more about our Society. EOCS welcomes enquiries from potential new members, whether absolute beginners or experienced builders. The JOIN page gives membership costs and contact details for our Membership Secretary.